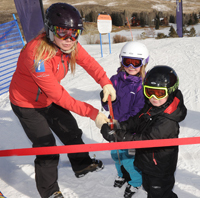 Sun Valley Resort held a ribbon-cutting ceremony on Sunday to mark the opening of its new one-acre Prospector Park on Dollar Mountain. Sun Valley ski instructor Aaron Fabish said the terrain-based teaching area will allow beginner skiers and snowboarders the opportunity to accelerate the learning process. Prospector Park will feature a mini pipe, a bank turning system that Fabish said will work skiers from a wedge to parallel position and rollers that will initiate up and down movements. In preparation for the new park, snow sports director Tony Parkhill said that a dynamic curriculum has been developed to allow new skiers and boarders to learn more quickly. Parkhill said he is particularly excited about the opening of Prospector Park because of how people will rapidly gain confidence on the mountain in a mellow atmosphere. During the ceremony, the vast majority of those in attendance were elementary-age children ready to make the first official run down the new terrain. However, Fabish insists Prospector Park is a place where beginner skiers and boarders of all ages are encouraged to try. Ski instructor Shannon Price concurred. Parkhill also said he’s excited for the future of Dollar Mountain, as Prospector Park proved itself to be an effective teaching site during its “soft opening” for novice skiers and boarders.